Between posts from President Donald Trump and hundreds of political pundits, it might have been tough to keep up with Foggy Bottom news on your Twitter feed this summer. Not to worry – if you’re out of touch with GW news, we’ve got you covered. After nearly a year, the Department of Education concluded a probe into GW’s handling of sexual misconduct cases after officials reached a resolution agreement with the Office for Civil Rights last month. The complaint that sparked the investigation, which was filed two years ago, alleged that officials mishandled a student’s sexual violence case and retaliated against them for reporting an incident. The closure of the investigation also accompanies the implementation of new Title IX policies this summer, including a switch to a single investigator model for Title IX investigations and a mandate that all faculty report incidents of sexual harassment to the Title IX office. The Alumni Association’s governing body removed Venessa Marie Perry, the organization’s president, from her post in July following internal turmoil about the organization’s planned merger with the University’s alumni office. The decision came after at least seven members of the GWAA resigned over the merger and claimed Perry silenced anyone who voiced opposition to the change. Four members of the board also resigned when Perry was ousted from the position. The incoming freshman class will be the largest since at least 2008, with roughly 2,800 new students coming to campus this fall – about 200 more than last year. To accommodate the larger class, Fulbright Hall, which typically holds upperclassmen, now houses some first-year students, and some departments added more sections for introductory courses. Construction is underway for a new outdoor study space outside Gelman Library. 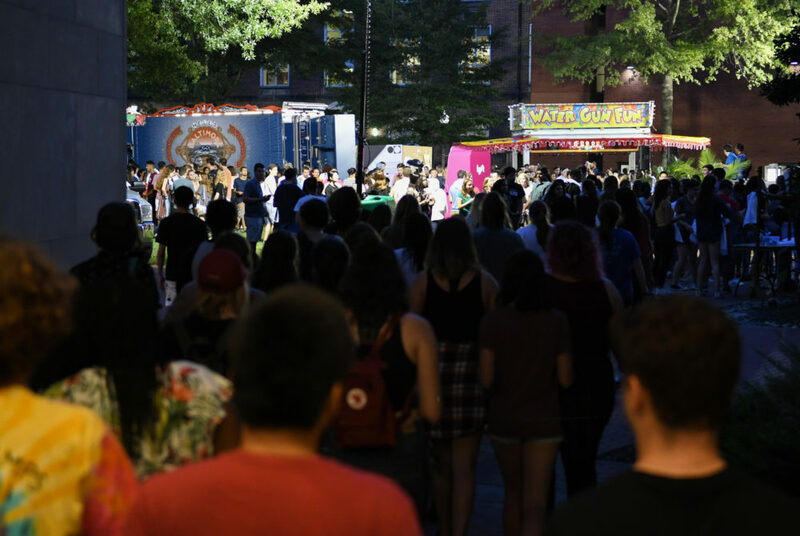 Students may see construction workers across campus this year as officials pursue three new projects on GW’s main campus, which local governing groups approved over the summer. 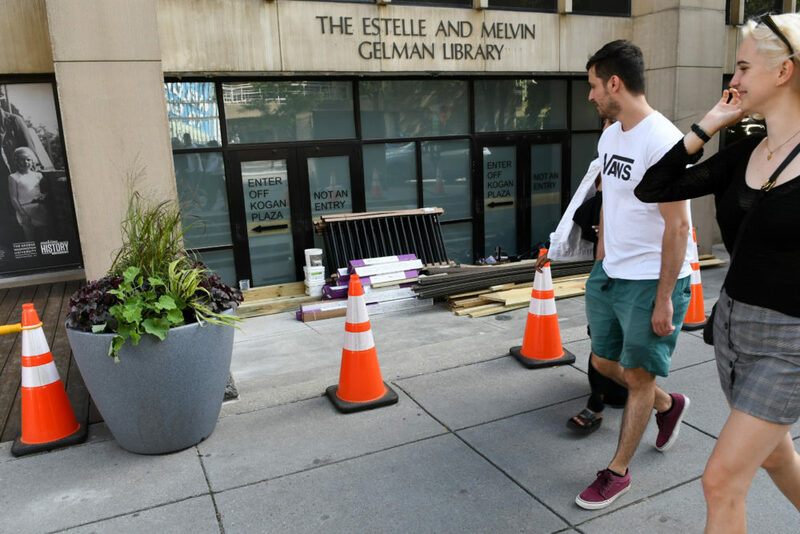 Gelman Library will soon feature a new outdoor study space on H Street, and later this semester, two new crosswalks will be installed between Kogan Plaza and District House. Mayor Muriel Bowser also greenlighted construction for a helipad atop the GW Hospital, which will be completed by the spring semester. A federal probe into the accessibility of GW’s websites ended in March after the University reached a resolution agreement with the Office for Civil Rights. The findings of the investigation weren’t immediately available to the public – but an agreement, as well as a resolution letter, were obtained by The Hatchet in June. The documents detailed improper formatting, a lack of captions and inaccessible content on GW’s main sites, including the homepage and the University’s Facebook page. In the agreement, officials agreed to a five-part plan to improve online accessibility, which will include new training for staff members and a re-evaluation of current resources. Officials unveiled two new offices – the Office of Student Success and the Office of Student Systems, Services and Analytics – in July as part of the first major changes to the structure of GW’s student affairs services. The Office of Student Success will oversee areas like registration, summer programs and international enrollment, while the Office of Student Systems will partner with the Division of Information Technology to collect and analyze data related to student life. M.L. “Cissy” Petty also began her role as the first dean of the student experience, overseeing areas like housing, student organizations and the Colonial Health Center.